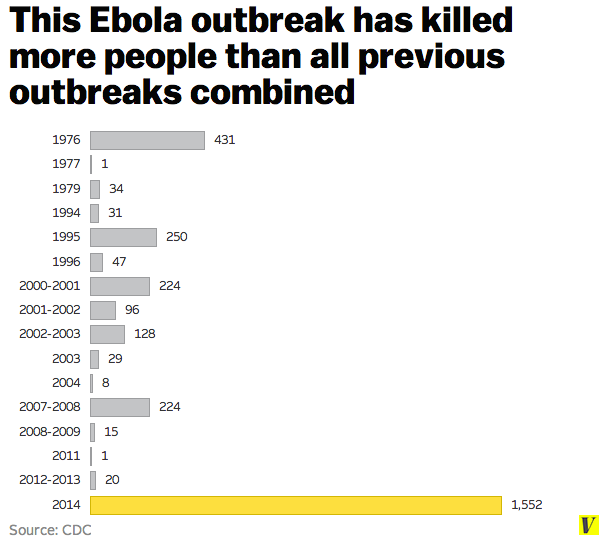 The current Ebola outbreak in West Africa has now killed more people than all previous Ebola outbreaks combined. The latest World Health Organization data on this year’s Ebola outbreak in West Africa shows 3,069 probable and confirmed cases and 1,552 deaths. The number of cases continues to accelerate, with 40 percent of the total cases occurring in the last 21 days. All the negative hype will hinder, and might even destroy, Liberia’s economy for the next 5 or 10 years. Maybe the optimal response to a disease outbreak is overhype, to get the most resources possible. I’m worried about the aftershock. The cost to everyone who survives the disease looks to be very, very high in terms of lost growth, jobs, social programs, and the like. What might be the consequences of hype? Here’s a US survey that suggests 40% of Americans are concerned about an outbreak at home and that a quarter think their family might get it. And that was two weeks ago. Frankly that smells like it might be a poorly worded question or interpretation, but either way, I think “large scale irrational fears” adequately sums up the situation. According to the World Food Program, 64 percent of Liberians live in poverty. Infrastructure is poor—buildings in Monrovia that were looted during the war remain abandoned. Only 14 percent of Liberians attend secondary school. Liberians have good reason to believe that their government is not doing enough to increase quality of life in the country. Hospitals are often long distances from towns and villages, and the ones that do exist aren’t properly equipped. Citizens know that government officials often leave Liberia for the United States or Europe to seek medical attention. Since there are few clinics or hospitals outside of the capital, most Liberians have had little experience with the formal health system. When health workers appeared in communities to combat Ebola, citizens were skeptical of why the government was suddenly paying attention to them. Fauci was very careful to state that for the current outbreak in West Africa, the best approach will not be the vaccine or any new treatments, but rather the approach being used today and last week and last month and last year: early diagnosis, prompt isolation, and use of “personal protective equipment” including gowns, gloves, and masks. In other words, the vaccine being studied almost certainly will have no impact on the current West Africa crisis. Given the pace of useable science, even with the compressed, hurry-up-already system the candidate vaccine is being ushered through, preliminary results on safety and the vaccine’s ability to provoke a meaningful immune response will not be available until the end of the calendar year—at a point when the now 6-month long epidemic likely will have finally fizzled out. Currently, most funding for biodefense comes from civilian sponsors in the United States, not the military. Aside from Zmapp, most of their therapies for other dangerous pathogens—like Marburg virus and Staphylococcal enterotoxin B—get funding from the U.S. National Institutes of Allergy and Infectious Diseases. Again, Zmapp may fail. Most experimental drugs do. But other medical countermeasures for Ebola relate directly to investments in biodefense, as well. For example, research into one Ebola vaccine began when the U.S. National Institutes of Health asked a Canadian company to reapply technology it had developed for anthrax to also fight Ebola. Several other potential therapies for Ebola—such as TKM-Ebola and AVI-7537—also resulted from private collaboration with USAMRIID. So did the GSK/NIAID Ebola vaccine that authorities have just approved for human trials. Therefore, what little hope there is for vaccines and therapies against naturally occurring Ebola depends in part on research and development for biodefense. Using genetic sequences from current and previous outbreaks, the researchers mapped out a family tree that puts a common ancestor of the recent West African outbreak some place in Central Africa roughly around 2004. This contradicts an earlier hypothesis that the virus had been hanging around West Africa for much longer than that. The data, on the whole, supports what epidemiologists have already deduced about how the virus spread into Sierra Leone. More than a dozen women became infected after attending the funeral of a traditional healer who had been treating Guinean Ebola patients and contracted the disease. One surprise from the paper is that two different strains of Ebola came out of that funeral. This suggests that either the healer was infected with two different strains or that another person at the funeral was already infected. As Ebola then traveled across Sierra Leone, a third strain of the virus appeared.